The Angels made their Target Field debut on Friday, which inevitably begs the question: what do you think, Torii? "Gardy's office is like Bill Gates' office!" Torii Hunter told reporters, in awe of Target Field's amenities. Gardy gave Torii a special tour of the ballpark early Friday afternoon. While the Angels were warming up before Friday night’s game, I looked around for Torii—but he was conspicuously absent. After the Angels left the field, however, I noticed a player come out to warm up alone. One of the things I was curious to see was what the fan reaction to Torii would be at Target Field. You may remember that Torii’s first game as an Angel was actually an away game against the Twins at the Metrodome back in 2008. The Twins played a special thank you video for Torii when he was announced in the lineup, and Twins fans cheered him the first time he came up to bat. After that, Torii was booed. So was Target Field any different? So yeah—I suppose it’s a lot easier to get over Torii being a traitor when he comes back crying after seeing how beautiful the Twins’ new ballpark is. Did you catch that? My instincts kicked in as soon as I heard it—Torii’s batting music from his last year as a Twin (“This is Why I’m Hot”). 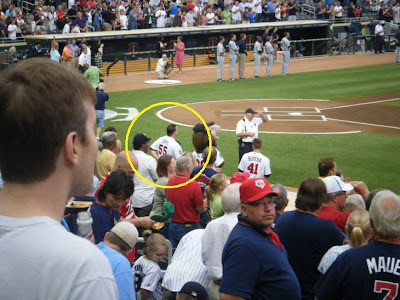 You can see Torii pause and say something to Joe Mauer when it starts to play. I've never heard batting music played for a non-Twin at a Twins home-game before. Brian Duensing went on to pitch 8 marvelous innings of baseball, and the Twins beat the Angels 7-2. The loss pushed the Angels one game under .500, while the Twins are an amazing 20 games over .500. Wonder what Torii thinks about that! I was going to write about how Tony Oliva sat by the Tony O’s Cuban Sandwich stand today before the game. He is so awesome. And I was going to write about how our White Sox fan friend made us super delicious friendship bread. I was going to write about Kirby the Kestrel, finally coming back to the foul pole (for just a moment). I was going to write about Bobby Thompson. And I was also going to write about how all of the guys sitting in front of us were flabbergasted when my boyfriend called O-Dog’s homerun in the first. But let's just get to the point. Did you hear Pavano's new intro music? As we all know, Pavano went on to win the game last Friday, and the Twins as a whole went on to sweep the series against the A's. I was lucky enough to attend Friday's game, attend Saturday's game, and have Kevin Slowey pulled before possibly completing a no-hitter on Sunday when I did not attend. I would have really raged about missing a no-hitter, so kudos to high pitch counts and tendinitis issues in Slowey's elbow. On Saturday, mini-replicas of Target Field were given away to the first 10,000 fans, so I got to the park as soon as the gates opened. According to the girls I overheard in the bathroom, the replica looked like an ash tray. I hadn't opened mine. While walking around before the game, I noticed something a little out of place. It's Waldo watching batting practice--IN Target Field! If you have no idea what I am talking about, here’s some background information: Waldo is a well-known Twins fan and ballhawk. He attended every game at the Metrodome since 2004, sitting in center field and cheering on Torii Hunter. "I know he's my biggest fan," Hunter said about Waldo in a Star Tribune article from 2007. "I think he's one of the guys I'm going to miss most because he comes to every game." Newspapers and bloggers have written several stories on Waldo’s fandom and ballhawking. 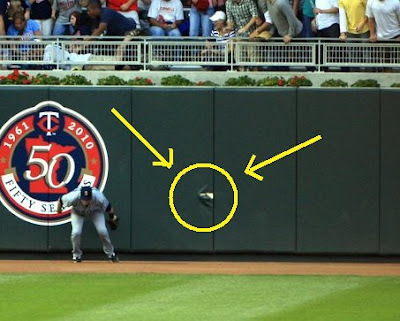 According to Alright Hamilton!, Waldo had his tickets to the final six games at the Metrodome stolen last year, and the Twins were uncooperative with helping him out. Waldo felt the Twins had treated him unfairly at other times as well. 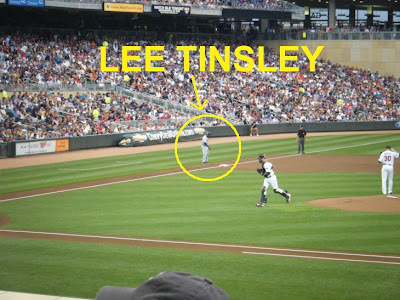 So he decided to boycott Target Field. Instead of buying tickets, Waldo sat outside Gate 34 on Kirby Puckett Plaza (and please do not tell me that isn’t the real name of the plaza). I have never personally met Waldo, although he rode his bike by me before a game a few weeks ago and complimented my Radke jersey. I didn’t go up and ask Waldo why he decided to come into Target Field, although I probably should have. Saturday's game was also special because it was my friend, Johnny Love's, first time at Target Field. You might know about Johnny if you are in Uptown a lot. He rides his bike around, carries everything he owns in his bike trailer, and has a home-made Foghat tattoo on his arm. Johnny's been sober for seven months now and doing relatively spectacular, so I figured I could take him to the game. He's not even the biggest baseball fan, but I lent him a jersey and brought him in, and holy crap he was excited. He told me the last baseball game he went to was one of the very first exhibition games at the Metrodome back in 1982. I gave Johnny the grand tour. I took him into the Metropolitan Club and he told me he had some relative named Mush Morris who played for the Millers. We went to look off the balcony and I noticed Waldo taking baseball cards and empty Target Field replica boxes out of a trash can. I was jealous I didn’t think to do that. 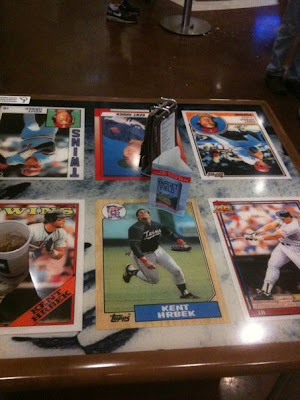 (Per my Mom: baseball cards given away at the ballpark can be very rare and valuable, and they gave out a big card in addition to the replica). Of course, I also don’t think to come to batting practice all the time and collect thousands of used balls. 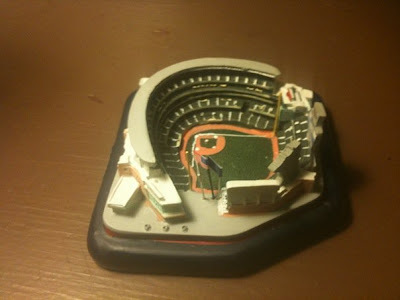 Clearly I'm a little behind on the baseball collector's learning curve. In any case, I hope Waldo had a good time. I know Johnny did. Johnny and I at the game. Brian Duensing sure didn't disappoint! It does look like an ashtray. 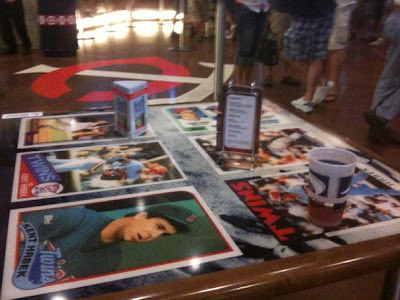 Earlier this season I blogged about a couple from Japan that I met at Target Field. The two were big baseball fans and had great enthusiasm for the Twins. We asked them what their favorite team was and they told us they were Hiroshima Carp fans, and gave me a Hiroshima Carp pin. 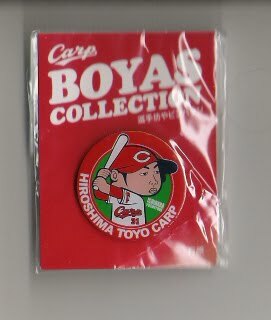 Later, I read more about the Carp and learned that they have pretty intense fans, never finished higher than third place in their first 25 years, and focus on developing younger players to be competitive on a tight budget. I decided the Hiroshima Carp were pretty cool. The Twins just did something they have never done before at Target Field: sweep an entire home-stand! Granted, the home-stand was just three games long. And it was against the struggling Seattle Mariners. But whatever. Twins swept the home-stand! WOOHOO! On Friday night, Ken Burns—as in “Ken Burns: Baseball”—threw out one of the many ceremonial “first” pitches that occur before every game. While throwing out the pitch, the PA guy said that “Baseball” is the most watched program on PBS ever, which I did not know. I am not surprised though—it has to be the best documentary of all time. It’s all about baseball. So if for some reason you haven’t seen this, please set aside 18 hours the next Twins off-day to watch the documentary in its entirety. Then sometime on or after next September 28th and 29th, set aside 4 more hours to watch Ken Burns’ new sequel covering everything that has happened in baseball since 1994. It’s going to be awesome. After seeing Ken Burns, I got my first glimpse of the newest Minnesota Twin—Matt Capps. I was a little dismayed to see him wearing number 55, but I guess if Mike Redmond ever comes back just to hang out he doesn’t really need his number. It’s also hard for me to hold it against Capps after finding out he’s good friends with Doug Mientkiewicz, who even texted Capps on Thursday night to congratulate him on going to the Twins. Any good friend of Doug’s is a good friend of mine. Even A-Rod (who, if you didn’t know, was on the same high school baseball team as Doug). When the game started, I noticed something much more upsetting. 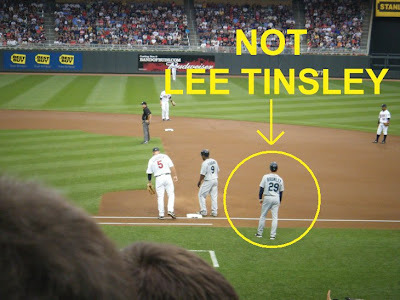 Lee Tinsley is no longer the Mariners' first base coach! Now he’s all the way over at third base! AND HE'S NOT EVEN WEARING HIS SOCKS UP TO SHOW OFF HIS GLORIOUS CALVES! As if Ken Griffey Jr. retiring before the trip to Target Field wasn't bad enough. But the Mariners are still fun to see because of Ichiro, who is one of my favorite players and really fun to watch. Ichiro is especially fun to watch when a Twins’ pitcher gets him to strike out three times in one game, which Kevin Slowey accomplished on Saturday. Slowey, along with Tim Hudson in 2003 and Josh Beckett in 2007, are the only pitchers to ever accomplish this. Yes—he stuck his spikes through the wall, lifted himself up, and RIPPED A GIANT HOLE! Didn’t anyone tell Michael that this is a brand new stadium, with brand new walls, partially funded with tax-payer dollars, so don’t come in and mess it all up you dung monkey!? 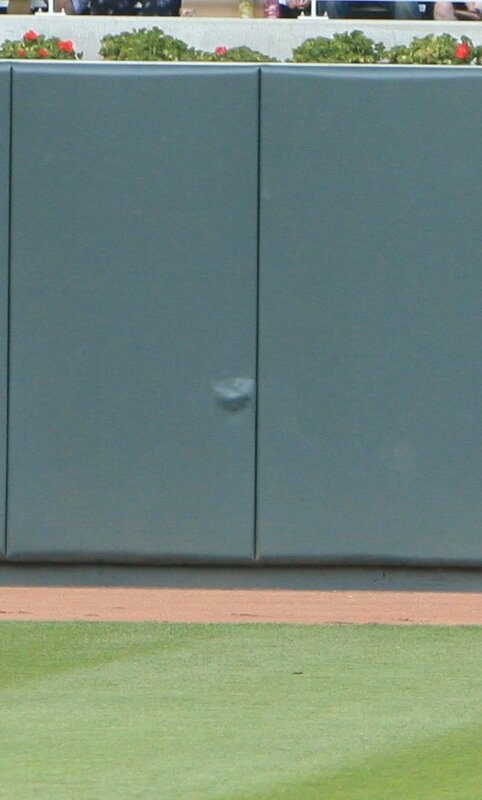 On Saturday, the Mariners did not rip any holes in the wall. But you could still see where the Twins had to patch up the hole from the day before. Saturday’s game went by pretty quick—it only lasted 2 hours and 7 minutes—so our ride was late picking us up from the ballpark. 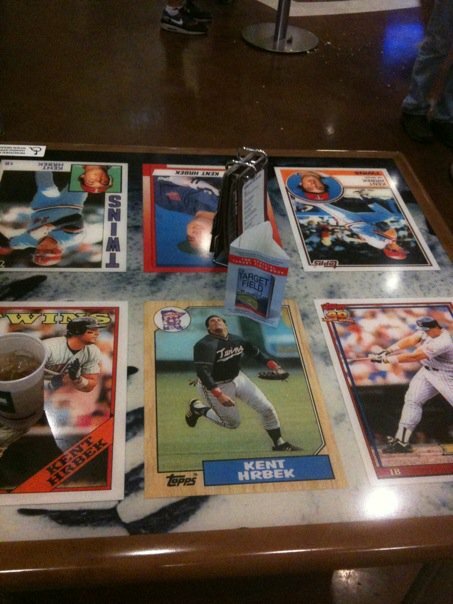 This wasn’t a problem though—we just hung out at Hrbek’s, which is like Disney Land for Twins fans who like to get boozy. Try the Rex burger from here sometime--but cut it in half before biting in. It's a juicy Lucy, which I learned (the hard way) will explode all over your pants if you're not careful. Never mind the fact that I don’t even have a house. Don’t these people look happy? Ichiro stretching (which he does a lot). Wally’s all hopped up on Vitamin D.
Kevin Slowey and some neat shadows. I'm really liking the vines on these things. Chone Figgins after Thome's 577th career homerun. Japanese fans are the best. Check out this awesome, successful dive by Casilla! All pictures used in this post are courtesy of me (the stupid ones) or my Mom (the awesome ones)!